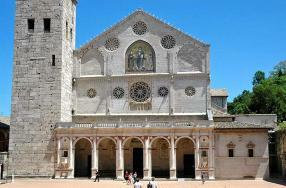 The Spoleto Cathedral, the city's most important civil monument, originally built in the Romanic style during the 12th century, has undergone subsequent modifications with the addition of a portico in the Renaissance style between 1491 and 1504 and the remodelling of the interior in the 17th century. In the upper part of the facade, which is hut-shaped and decorated with rose-windows and ogival blind arches, the great mosaic in the Byzantine style (1207) raffigurating Christ between the Virgin Mary and St. Giovanni, and placed between the symbols of the four Evangelists, stands out. The interior, made up of three naves on columms, contains, among many works of great artistic merit: in the first chapel on the right, a frescoe with the Madonna and Saints by Pinturicchio; above the middle portal bronze bust of Urban VIII by Bernini, and in the right transept the tomb of the painter Filippo Lippi. In fact, this last-named personage had realized in the Cathedral, and to be exact, in the apsis an important cycle of frescoes: Nativity, Annunciation, the Assumption of Mary and the Coronation.